A delegation from the Renmin University, China, visited the University of Delhi and met the Vice Chancellor, Professor Yogesh K. Tyagi on 30 January 2019. The members of the delegation included Professor Du Peng, Vice President; Dr. Lyu Jie, Dean, Silk Road School, Yang Yuntao, Senior Editor of Information Center, Chongyang Institute for Financial Studies; Dr. Wo Xiaojing, Deputy Director, Organizational Department; and Ms. Lu Wenqin, Liaison for Asian Universities at International Office. A delegation from the Tsinghua University, Beijing, China, visited the University of Delhi and met the Vice Chancellor, Professor Yogesh K. Tyagi on 24 January 2019. The delegation included Prof. WANG Xiqin, Executive Vice President, Tsinghua University; Prof. WANG Youqiang, Director, Tsinghua University Library; Dr. ZHANG Chuanjie, Associate Dean, Office of International Cooperation and Exchange, Tsinghua University; Ms. WANG Yaqian, Administrator of Policy and Programs, Asian Universities Alliance Secretariat, Tsinghua University; and a researcher (Dr. XIE Chao) and an alumnus (Mr. LEI Dingkun) of Tsinghua University studying in Delhi. H.E. Mr. Carlos Pereira Marques, Ambassador of Portugal to India, met the Vice Chancellor, Professor Yogesh K. Tyagi on 23 October 2018. Professor D.P. 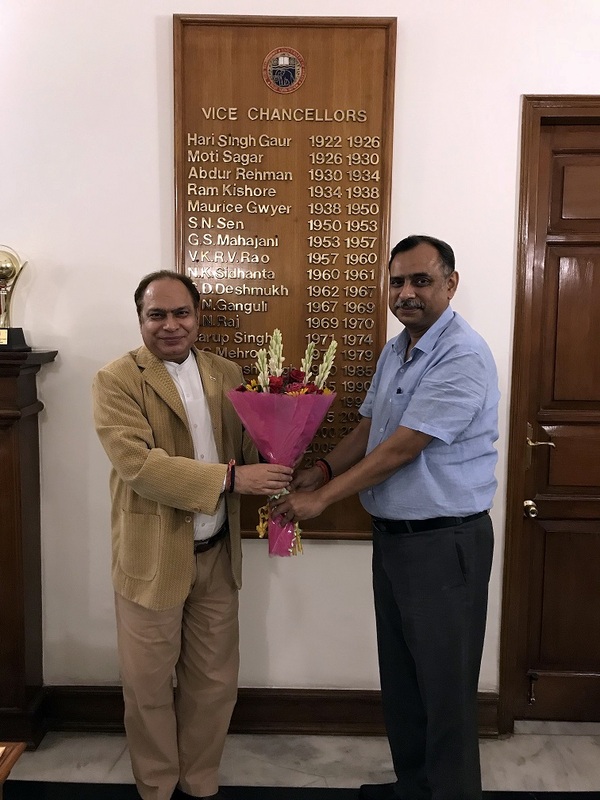 Verma, Chairman, UGC Expert Committee for Preparation of Learning Outcome Curriculum Framework on Human Rights along with its members, visited the University of Delhi and met the Vice Chancellor, Professor Yogesh K. Tyagi on 22 October 2018. A delegation from Croatia led by H.E. Ms. Marija Pejcinovic Buric, Deputy Prime Minister and Minister of Foreign and European Affairs of the Republic of Croatia along with H.E. 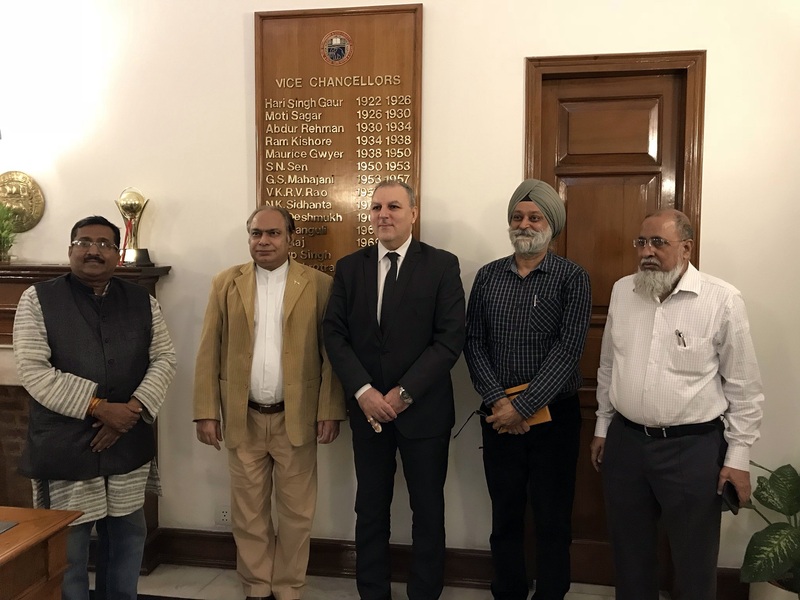 Mr. Petar Ljubicic, Ambassador of the Republic of Croatia to India, visited the University of Delhi and met the Vice Chancellor, Professor Yogesh K. Tyagi on 22 October 2018. 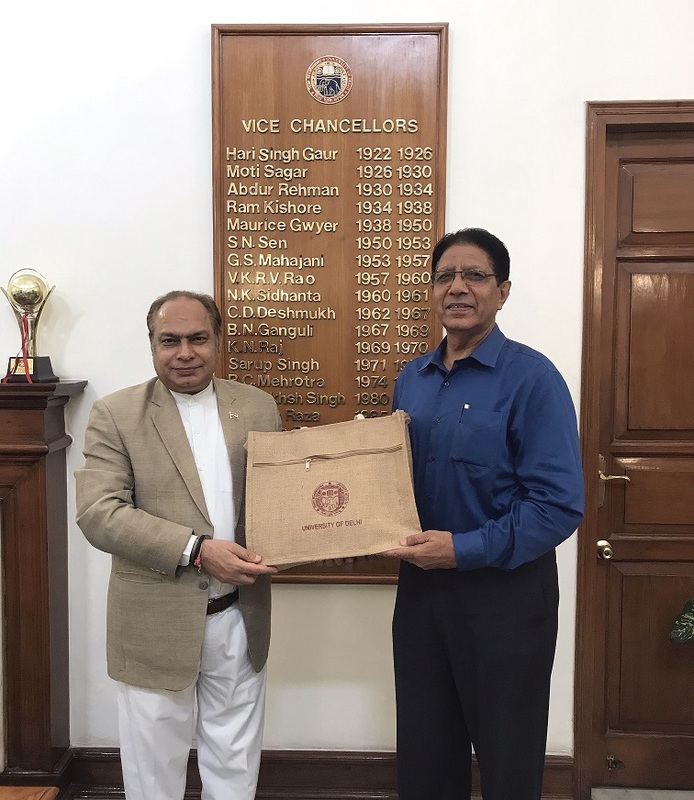 Dr. Amresh Kumar Singh, MP, Nepal, met the Vice Chancellor, Professor Yogesh K. Tyagi on 22 October 2018. 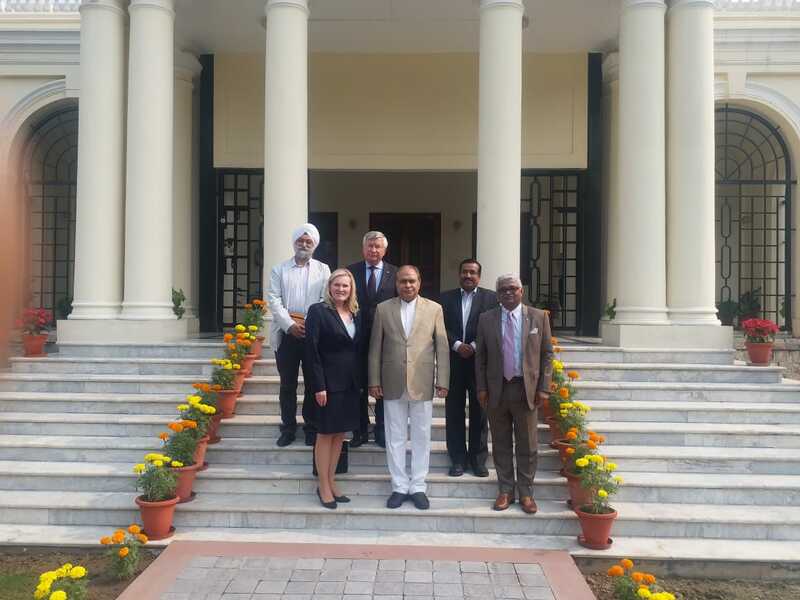 A delegation from the Norwegian University of Science and Technology (NTNU), Norway, visited the University of Delhi and met the Vice Chancellor, Professor Yogesh K. Tyagi on 12 October 2018. The delegation included Prof. Gunnar Bovim, Rector, Norwegian University of Science & Technology, Mrs. Rita Kumar, Advisor, International Educational Cooperation and Mrs. Nina Sindre, Coordinator of International Affairs, NTNU. 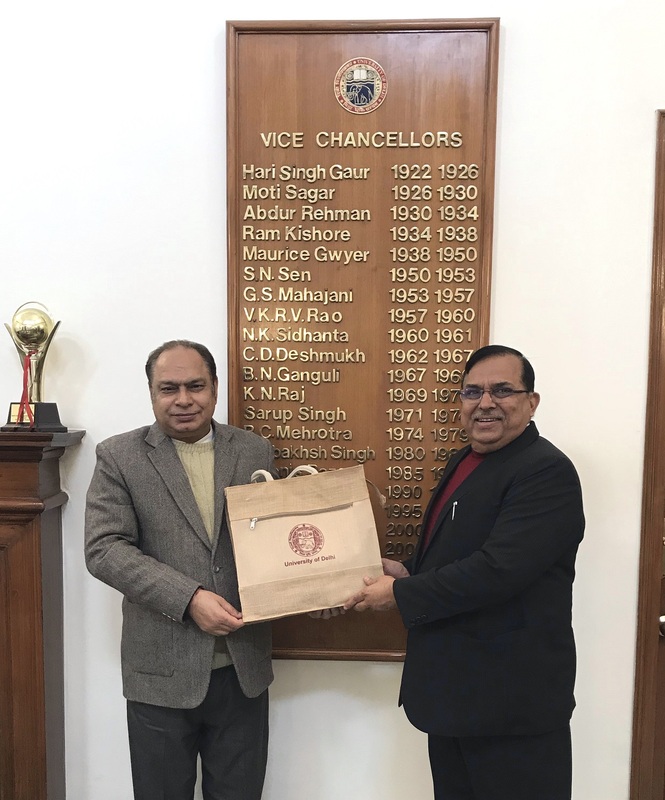 Professor (Dr.) Rahmat Mohamad, Dean, Faculty of Law, Universiti Teknologi MARA, Malaysia, visited the University of Delhi and met the Vice Chancellor, Professor Yogesh K. Tyagi on 9 October 2018. A delegation from the Tongmyong University, Republic of Korea, visited the University of Delhi and met the Vice Chancellor, Professor Yogesh K. Tyagi on 18 September 2018. The delegation included Mr. Hong-Sub Jung, President of Tongmyong University; Mr. Eung-Joo, Lee, Vice President, Head Office of Education Innovation; Mr. Jae-Jin, Jang, Dean, Office of Student Affairs; Mr. Joong-Rak Kweon, Dean, Office of International Affairs, Mr. Byung-Jin Lee, Lecturer, College of General Education; Mr. Young-Mo Kang, Guest Researcher, the Institute of Indian Culture. 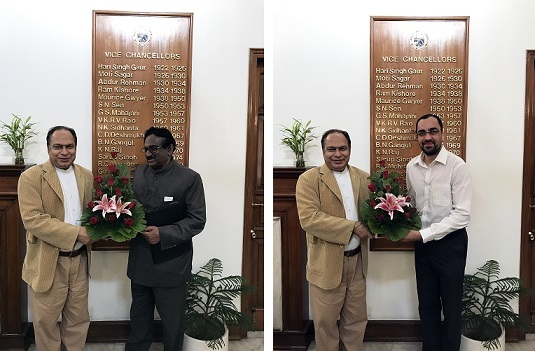 Professor Address M. Malata, Vice Chancellor, Malawi University of Science & Technology (MUST), Malawi, visited the University of Delhi and met the Vice Chancellor, Professor Yogesh K. Tyagi on 17 September 2018. 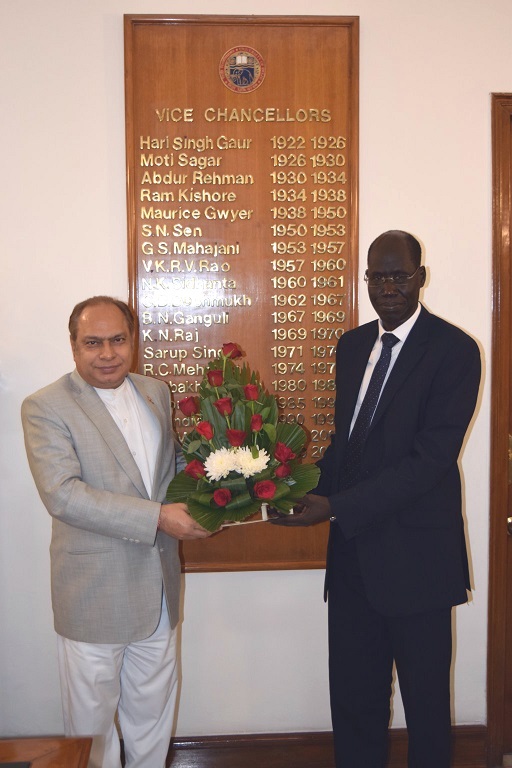 Professor (Dr.) John Apuruot Akec, Vice Chancellor, University of Juba, South Sudan, visited the University of Delhi and met the Vice Chancellor, Professor Yogesh K. Tyagi on 20 August 2018. 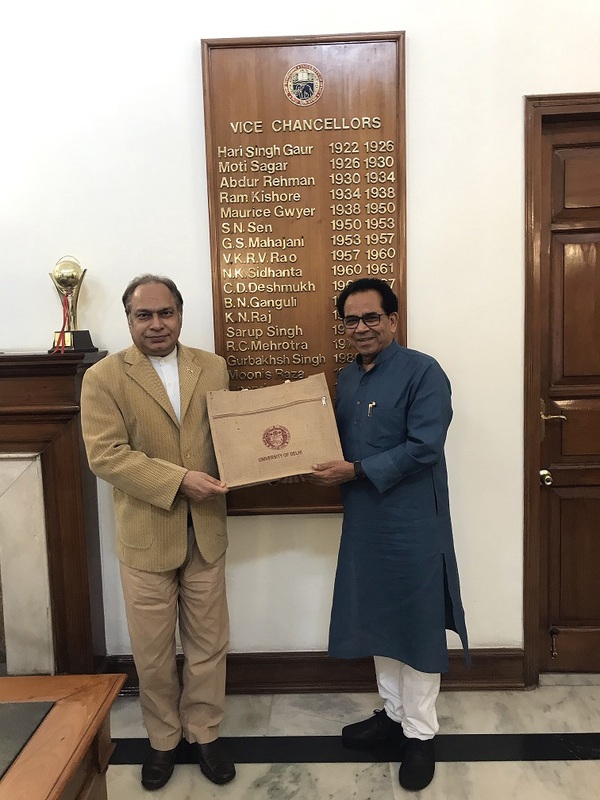 Prof. Ashok Chakradhar, Hindi author and poet, met the Vice Chancellor, Professor Yogesh K. Tyagi (August 6, 2018). Professor Arun Pandey, Former Dean of Colleges, University of Delhi, has joined as Vice Chancellor, Mansarovar Global University, Bhopal, and met the Vice Chancellor, Professor Yogesh K. Tyagi (August 6, 2018). Dr. G.V. 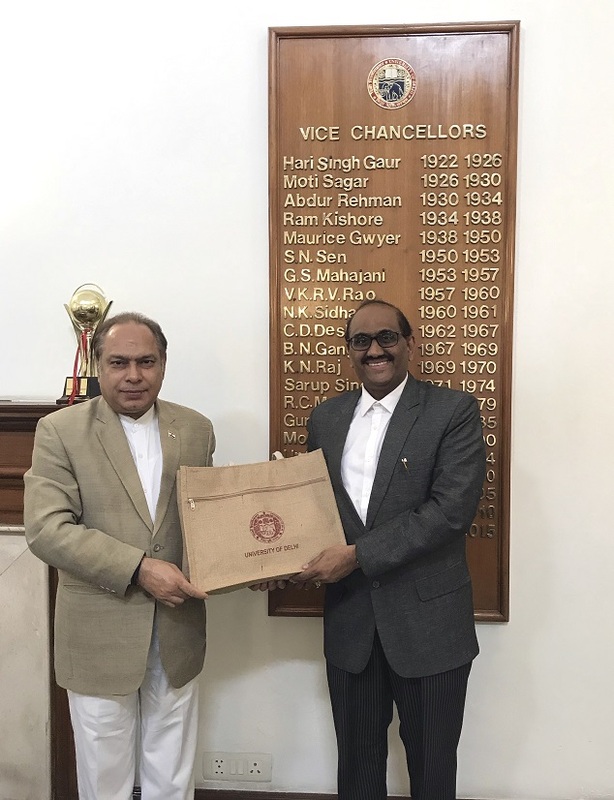 Rao, Advocate, Supreme Court of India, met the Vice Chancellor, Professor Yogesh K. Tyagi (July 13, 2018). Mr. Rahul Gupta (also known as Mountain Man), first mountaineer from Delhi University to climb Mount Everest (8848 m), met the Vice Chancellor, Professor Yogesh K. Tyagi (July 25, 2018). Shri Praveer Ranjan, IPS, Special Commissioner of Police, Intelligence, Delhi Police, met the Vice Chancellor, Professor Yogesh K. Tyagi (18 July 2018). 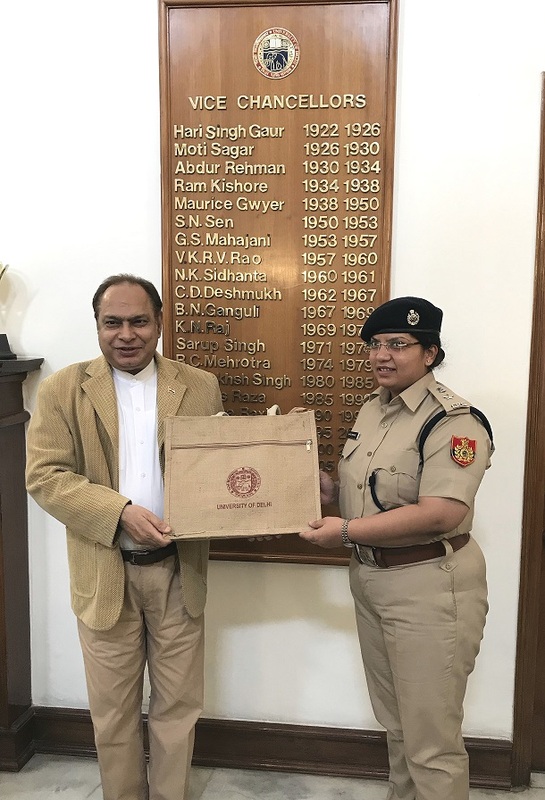 Mrs. Nupur Prasad, IPS, Deputy Commissioner of Police, Delhi North District, met the Vice Chancellor, Professor Yogesh K. Tyagi (July 18, 2018). 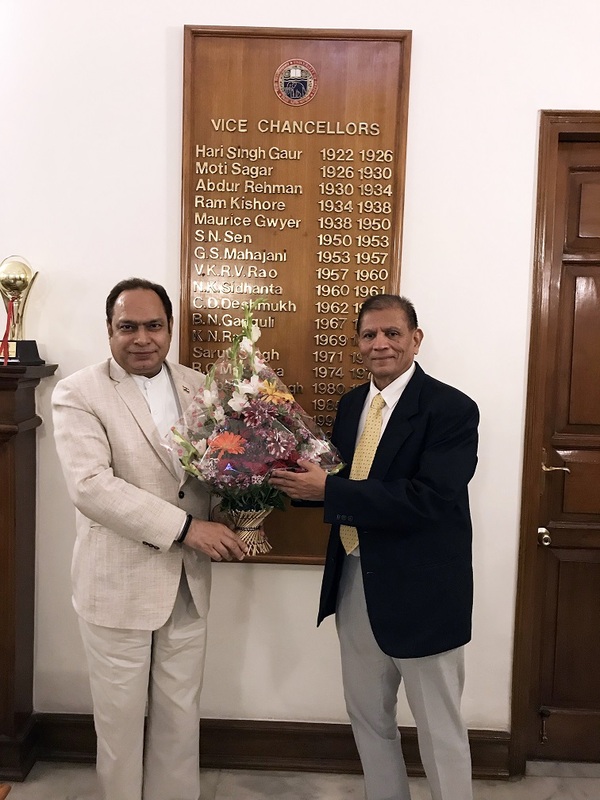 Shri T. N. Chaturvedi, Chairman, Governing Body, PGDAV College, University of Delhi, met the Vice Chancellor, Professor Yogesh K. Tyagi (May 15, 2018). Prof. (Dr.) Tamma Suryanarayana Sastry, Vice Chancellor, The Tamil Nadu Dr. Ambedkar Law University, Chennai, met the Vice Chancellor, Professor Yogesh K. Tyagi (May 14, 2018). Shri Sultan Singh Backliwal, Managing Partner, Indian Arts Palace, along with her daughter Smt. 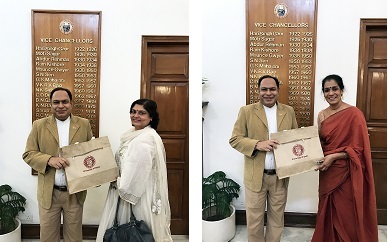 Radhika Backliwal, met the Vice Chancellor, Professor Yogesh K. Tyagi (May 4, 2018). H.E. Mr. Shin Bongkil, Ambassador of the Republic of Korea, visited the University of Delhi and met the Vice Chancellor, Professor Yogesh K. Tyagi (April 4, 2018). A delegation from Syria led by Dr. Atef Naddaf, Syrian Minister of Higher Education visited the University of Delhi and met the Vice Chancellor, Professor Yogesh K. Tyagi (April 3, 2018). The delegation included Dr. Riad Kamel Abbas, Syrian Ambassador to India, Mr. Bisher Al Shaar, Minister Counsellor. 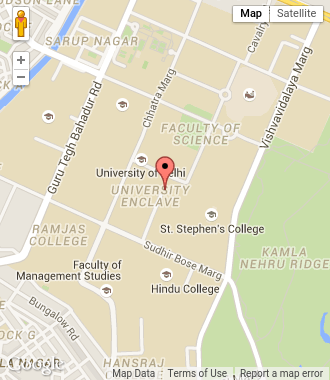 Dr. Aman Shah, Director, Quality Assurance and Accreditation Office, O.P. Jindal Global University, Sonipat, Haryana, met the Vice Chancellor, Professor Yogesh K. Tyagi (March 13, 2018). 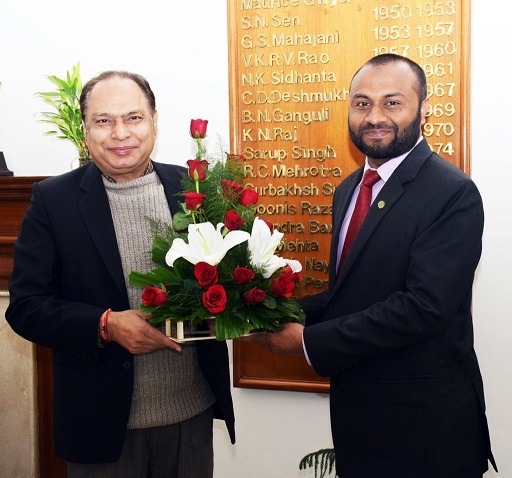 Professor Ivelaw Lloyd Griffith, Vice Chancellor, University of Guyana, visited the University of Delhi and met the Vice Chancellor, Professor Yogesh K. Tyagi (March 12,2018). H.E. 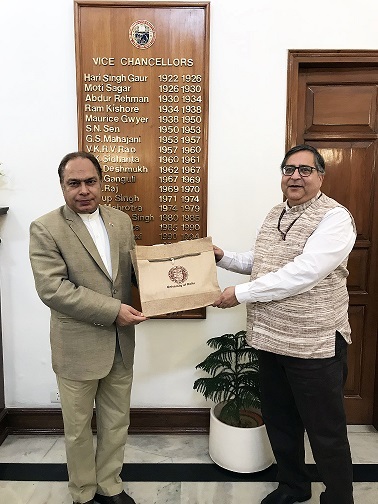 Augusto Montiel, Ambassador of Bolivarian Republic of Venezuela to India, visited the University of Delhi and met the Vice Chancellor, Professor Yogesh K. Tyagi on March 7,2018. A delegation from the University of Tokyo visited the University of Delhi and met the Vice Chancellor, Professor Yogesh K. Tyagi on 21 February 2018. The delegation included Dr. Norio Matsuki, Executive Vice President in charge of Alumni & Professor, Graduate School of Pharmaceutical Science, University of Tokyo; Mr. Kazuhiro Mori, Director Alumni Office, University of Tokyo; Dr. Ranjana Mukhopadhyaya, Associate Professor, Department of East Asian Studies, University of Delhi & Director of The University of Tokyo Alumni Association of India (PhD in Literature); Mr. Shrikrishna Kulkarni, Chairman Board of Governors, India Institute of Management Calcutta & Director of The University of Tokyo Alumni Association of India (Maser of Eng.) and Mr. Hiroshi Yoshino, Director University of Tokyo India Office. Mr. M.M. Oberoi, IPS, Special CP, Special Cell, Delhi Police, met the Vice Chancellor, Professor Yogesh K. Tyagi (27 January 2018). 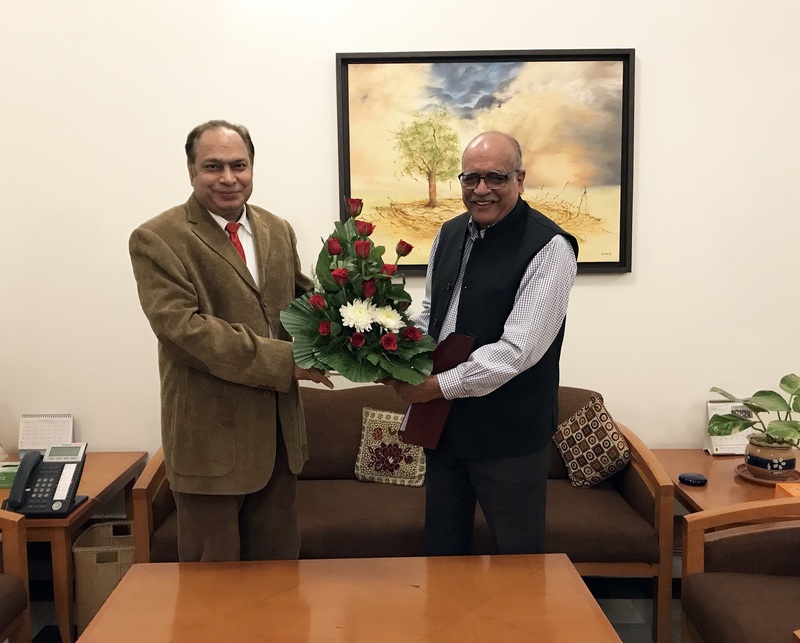 Dr. Mahesh Verma, Director & Principal, Maulana Azad Institute of Dental Sciences, New Delhi, met the Vice Chancellor, Professor Yogesh K. Tyagi (24 January 2018). H.E. 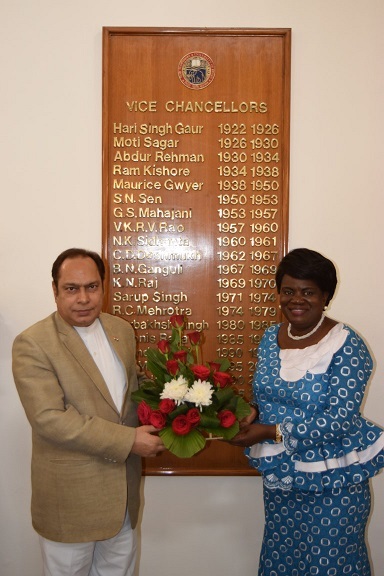 Ms. Jainaba Jagne, Gambian Ambassador, New Delhi, along with Mr. Alieu Bah, Counsellor has met the Vice Chancellor, Professor Yogesh K. Tyagi (18 January 2018). Smt. 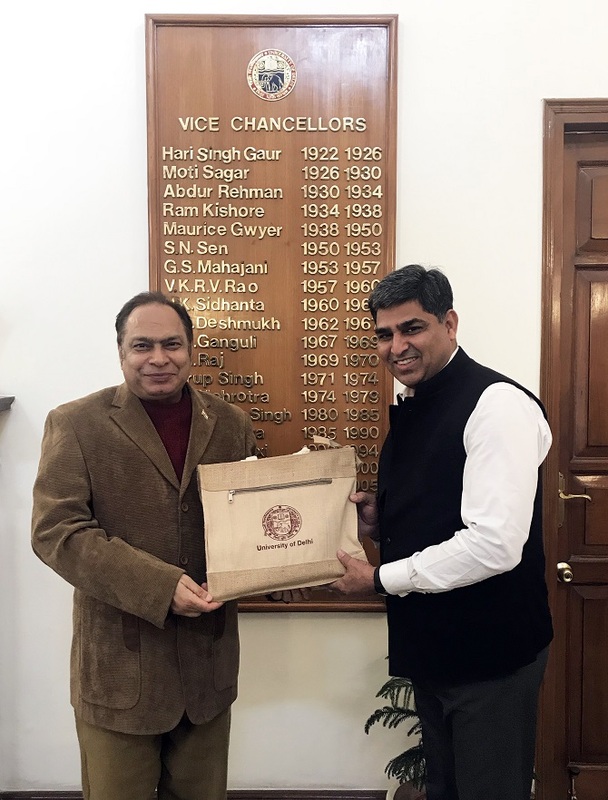 Krishna Raj, Hon'ble Ministers of State, Ministry of Agriculture & Farmers Welfare, visited the University of Delhi and met the Vice Chancellor, Professor Yogesh K. Tyagi (3 January 2018). 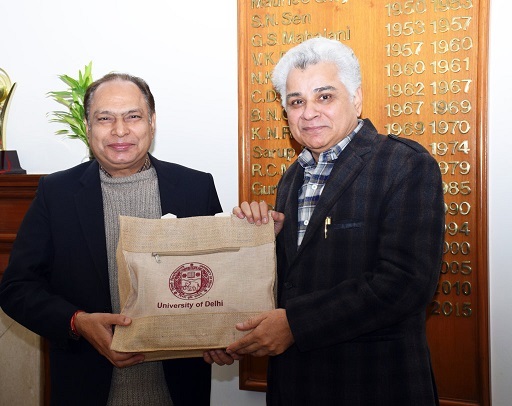 Shaheed Bhagat Singh's nephew Shri Abhay Singh Sandhu along with his spouse visited the University of Delhi and met the Vice Chancellor, Professor Yogesh K. Tyagi (12 December 2017). 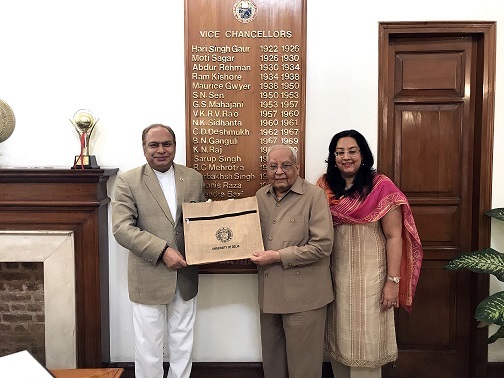 Shri O. P. Kohli, Hon'ble Governor of Gujarat, visited the University of Delhi and met the Vice Chancellor, Professor Yogesh K. Tyagi (11 December 2017). 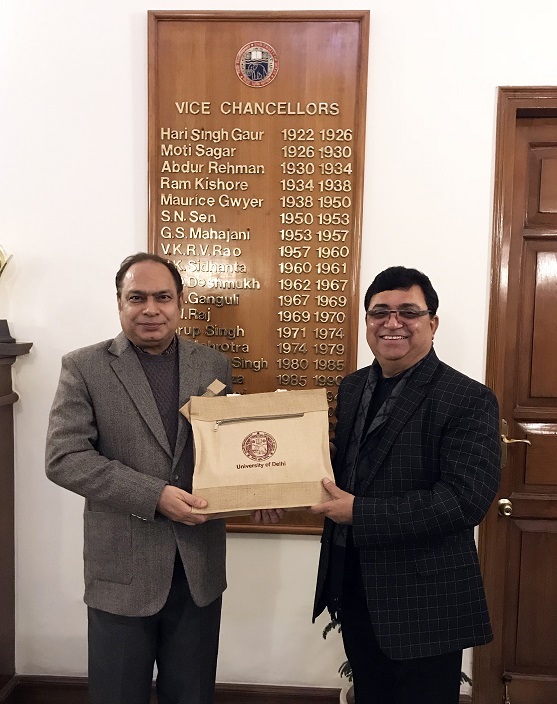 Shri Arun Bharat Ram, Chairman, Governing Body, Lady Shri Ram College for Women, met the Vice Chancellor, Professor Yogesh K. Tyagi (25 November 2017). 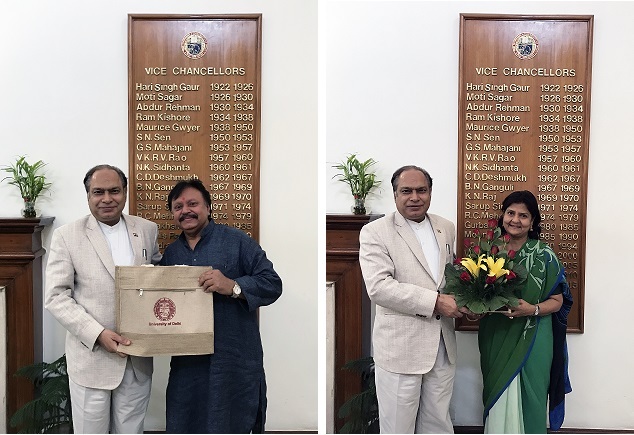 Chief Justice Gita Mittal, High Court of Delhi, visited the University of Delhi and met the Vice Chancellor, Professor Yogesh K. Tyagi (14 November 2017). A delegation from the University of Hong Kong (HKU), visited the University of Delhi and met the Vice Chancellor, Professor Yogesh K. Tyagi (8 November 2017). The Hong Kong delegation included Professor Peter Mathieson, President and Vice Chancellor, The University of Hong Kong; Prof. John Spinks, Senior Advisor to the President & Director of Undergraduate Admissions; Professor Nirmala Rao, Faculty of Education; Ms. Namrata Pandey, International Admission Advisor for HKU in Delhi and Ms. Sonakshi Srivastava, International Recruitment Counsellor in the admissions department at HKU. 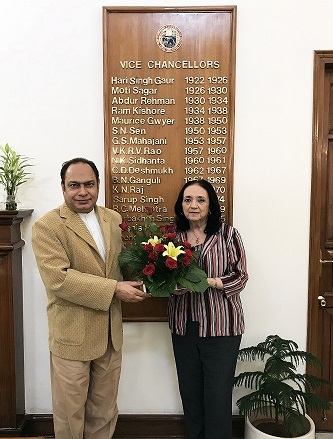 Dr. (Ms.) Lucrecia Mendez de Penedo, Vice President (Academic), Rafael Landivar University, Guatemala, visited the University of Delhi and met the Vice Chancellor, Professor Yogesh K. Tyagi (07 November 2017). 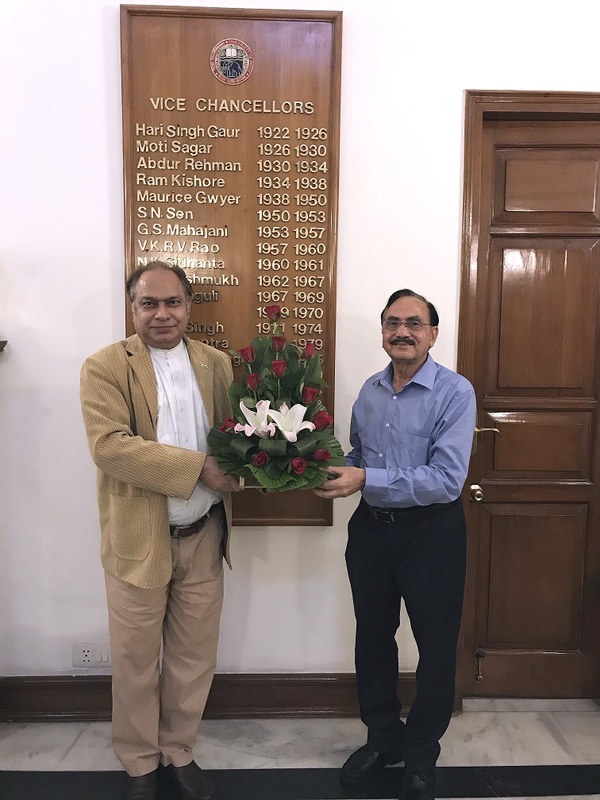 Commodore R.K. Mehta, Executive Director (Law), Delhi Electricity Regulatory Commission, met the Vice Chancellor, Professor Yogesh K. Tyagi (1 November 2017). Dr. T.C.A. 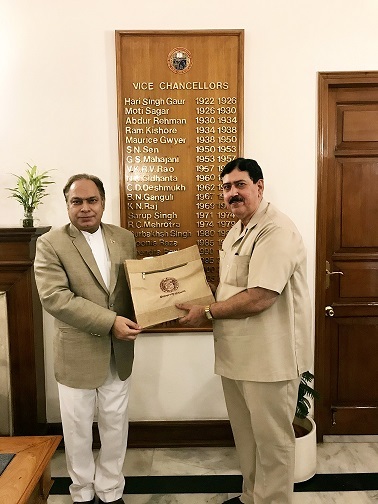 Anant, Chief Statistician of India & Secretary, Ministry of Statistics & Programme Implementation, Government of India, met the Vice Chancellor, Professor Yogesh K. Tyagi (27 October 2017). 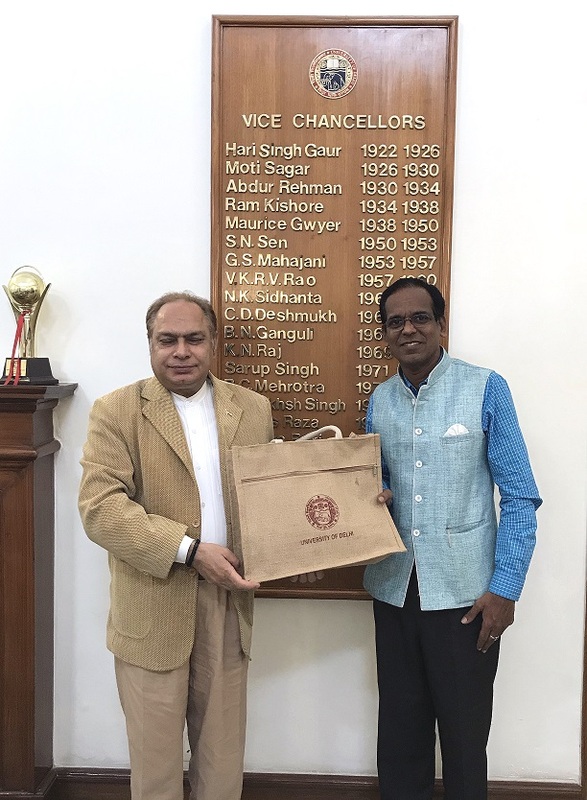 Prof. Rwekaza S. Mukandala, Vice Chancellor, University of Dar-es-Salaam, Tanzania along with the Public Relation Officer of Vice Chancellor’s Office, University of Dar-es-Salaam, visited the University of Delhi and met the Vice Chancellor, Professor Yogesh K. Tyagi on 09 October 2017. Dr. Charles Curti, Director of Human Resources, Radcliffe Institute for Advanced Study at Harvard University, met the Vice Chancellor, Professor Yogesh K. Tyagi (15 September 2017). Mr. Ashok Kumar Mago, the founder Chairman of Greater Dallas Indo American Camber, now known as (US-India Chamber of Commerce) along with Dr. Costas Tsatsoulis, Dean, School of Engineering, University of North Texas, met the Vice Chancellor, Professor Yogesh K. Tyagi (12 September 2017). Dr. S. Krishna Kumar, IAS (Retd. 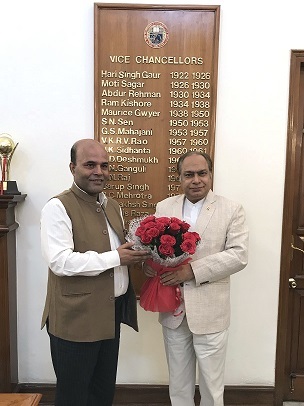 ), Former Union Minister, along with Mr. Samar Sharma, Advocate, Supreme Court, has met the Vice Chancellor, Professor Yogesh K. Tyagi (04 July 2017). 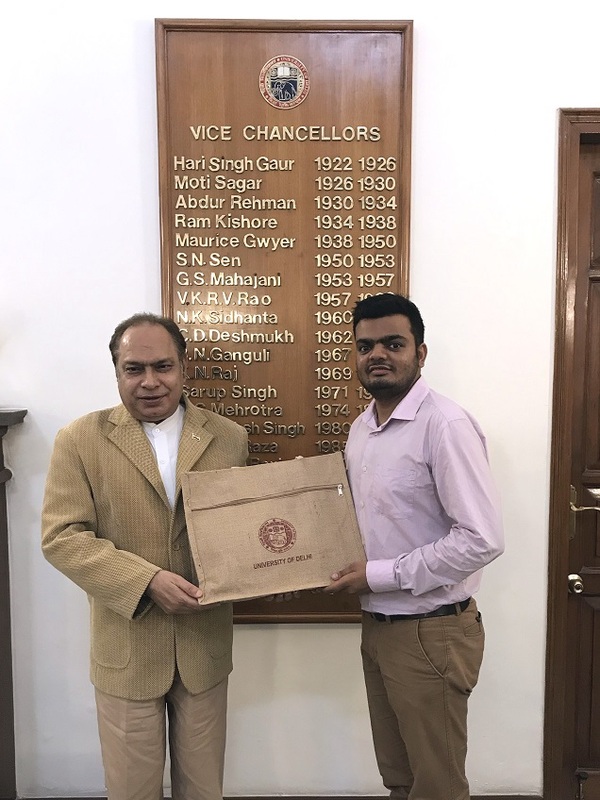 Mr. Kanishka Pandey, student of Campus Law Centre, DU, has met the Vice Chancellor, Professor Yogesh K. Tyagi (04 July 2017). Shri Rahul Khullar, IAS (Retd. 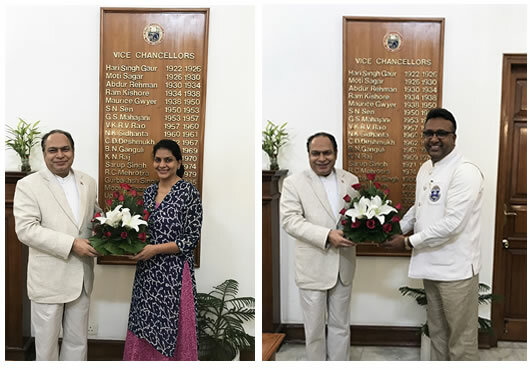 ), Chancellor Nominee on the Executive Council of the University, has met the Vice Chancellor, Professor Yogesh K. Tyagi (03 July 2017). 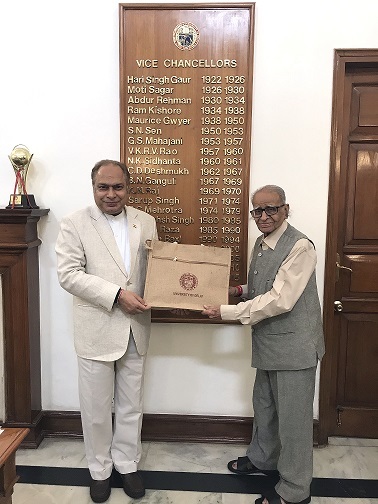 Shri Ram Bahadur Rai, Visitor Nominee on the Executive Council of the University, has met the Vice Chancellor, Professor Yogesh K. Tyagi (03 July 2017). Dr. Udit Raj, Member of Parliament, Lok Sabha from North West Delhi, has met the Vice Chancellor, Professor Yogesh K. Tyagi (29 June 2017). Shri Harshad P. Shah, Visitor's Nominee on the Selection Committees, has met the Vice Chancellor, Professor Yogesh K. Tyagi (15 June 2017). An advanced team from the Thailand led by H.E. Mr. Chutintorn Gongsakdi, Ambassador, Royal Thai Embassy in Delhi, visited the University of Delhi and met the Vice Chancellor, Professor Yogesh K. Tyagi(9 June 2017). Shri Syed Zafar Islam has met the Vice Chancellor, Professor Yogesh K. Tyagi (8 June 2017). Dr. Rajan Varghese has met the Vice Chancellor, Professor Yogesh K. Tyagi on (7 June 2017). Shri Prafulla Ketkar, Editor, Organiser Magazine, has met the Vice Chancellor, Professor Yogesh K. Tyagi (6 June 2017). Dr. Hariom Panwar, a renowned Veer Rasa poet from Meerut, visited the University of Delhi and met the Vice Chancellor, Professor Yogesh K. Tyagi (2 June 2017). A delegation from the South African Department of Higher Education and Training, visited the University of Delhi and met the Vice Chancellor, Professor Yogesh K. Tyagi (29 May 2017). The South African delegation included Mr. John Zulu, Deputy Director, NSF Strategic Projects; Dr. Thulani John Mbuli, Director, Workers College and Mr. Thapelo Matsa, Secretary, South African High Commission, New Delhi. 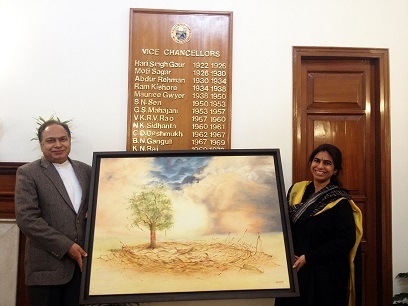 Professor Vaishna Narang, Center for Linguistics, School of Language, Literature and Culture Studies, Jawaharlal Nehru University, has met the Vice Chancellor, Professor Yogesh K. Tyagi (26 May 2017). The Chinese delegation included Prof. Wang Guangqian, President, Central University of Finance and Economics; Professor Ma Haitao, Director of Postgraduate Education; Professor Li Guijun, Director of Research; Professor Ge Jianxin, Vice Dean of Business School; Professor Zhang Xiaoyan, Director of International and Dr. Bhumika Gupta, Director MS program, Director of International Affairs (South-East Asia), Institute Mines Telecom, Telecom Ecole de Management, France. The Saudi delegation included Prof. Abdullah Saleh Al Washmi, Secretary General of King Abdullah bin Abdul Aziz International Center for Arabic Language Riyadh K. S. A.; Prof Abdul Rahman Al Mahsani and Prof. Abdul Rahman Alhumaighani. The delegation included Prof. Teresa A. Sullivan, President, University of Virginia; Jeff Legro, Vice Provost for Global Affairs; Ian Baucom, Dean of the College and Graduate School of Arts & Sciences; Ila Berman, Dean of the School of Architecture; Karen McGlathery, Assistant Vice President for Research, Sustainability, and the Environment; Nargis Cross, Senior Director of External Affairs and Leah Sumrall, President's Office. The Chinese delegation included Professor Ma Min, Chancellor of Central China Normal University (CCNU); H.E. Ambassador Luo Zhaohui, Ambassador of China to India; Mr. Gao Zhuoxian, Director of International Office, CCNU; Mr. Wu Helin, Deputy Dean, Wollongong Joint Institute, CCNU; Mr. Huang Gang, Secretary to the Ambassador. The ADIA delegation included Mr. Mohamed Al Qubaisi, Deputy Director, Private Equities Department; Mr. Majed Al Romaithi, Executive Director, Strategy and Planning Department; Mr. Hamad Shahwan Al Dhaheri, Executive Director, Private Equities Department; Mr. Mohamed Al Qamzi, Executive Director, Internal Equities Department; Mr. Ali Majid, Head of Equity Strategy, Strategy and Planning Department; Dr. Youguo Liang, PhD, CFA, Head of Global Research and Public Markets, Real Estate & Infrastructure Department; Mr. Euart Glendinning, Global Head of Corporate Communications & Public Affairs and Mr. Aditya Bhargava, Portfolio Manager, Real Estate & Infrastructure Department. The Taiwan delegation included Prof. (Dr.) Tsong-Ming Lin, President, Nanhua University; Shaw SuHwei Lin, President's Wife; Dr. Chao-Hsien Chiu, Director, office of International; Prof. Dr. Chue-Ming Shi, Graduate Institute of Religious Studies; Prof. Jao-Jia Horng, Graduate School of Safety, Health and Environmental Engineering; Prof. Dr. Henry H Chen, Director, Science and Technology Division, Taipei Economic and Cultural Center, New Delhi and Ms. Rachel Kuo, Assistant Director. Title - Red thread: Hope, the very essence of life. The painting celebrates hope, the essence of life. The fallen dry branches and leaves lying on the foreground are akin to difficult rough situations of life. The red thread is symbolic of hope and is shown tied not only on the tree trunk but also on fallen dry branches and leaves. It signifies that one should be able to see hope in all situations including those where one feels as if one is fighting a loosing battle or facing extremely difficult impossible circumstances. The background also echoes hope overlapping dark clouds. Title- Water of faith enriching lives. The tree trunks are symbolic of life and the water with lotuses metaphorically expresses faith. It shows water entering the tree trunks through its roots symbolically showing lives getting enriched and strong through faith. The painting celebrates the significance of faith in ones life. 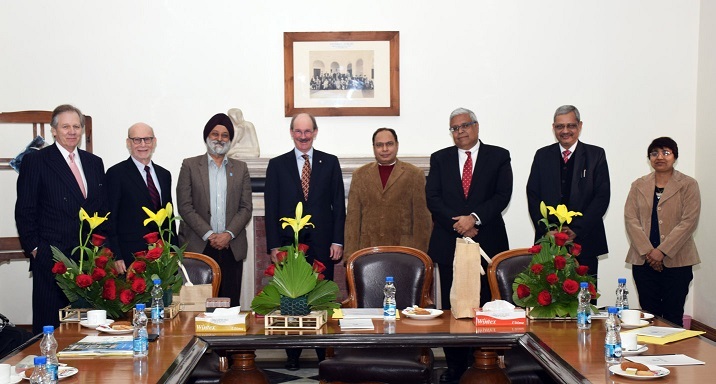 The Canadian delegation included Dr. Peter Mascher, Associate Vice President, International Affairs; Dr. Ishwar Puri, Dean, Faculty of Engineering; Dr. Len Waverman, Dean, School of Business and Mr. Paul Grossman, Director, Development.